XBMC Media Center is an award-winning free and open source media player and entertainment hub for digital media. 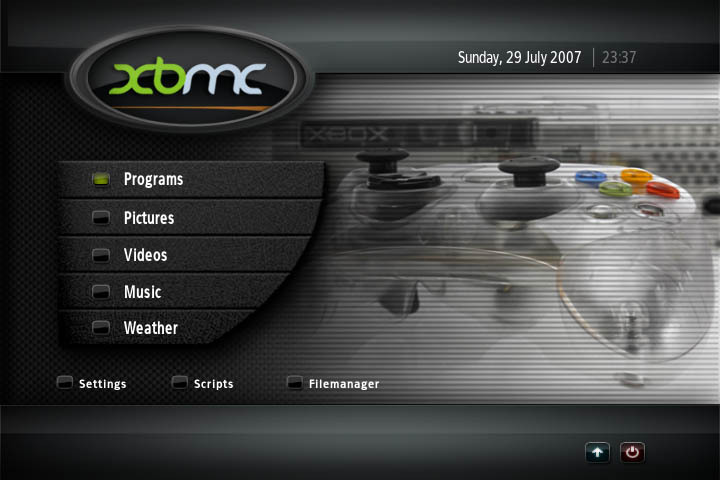 XBMC has been designed to be the perfect companion for your HTPC. Currently XBMC can be used to play almost all popular audio and video formats around. It was designed for network playback, so you can stream your multimedia from anywhere in the house or directly from the internet using practically any protocol available. ...... XBMC Media Center was designed for network playback, so you can stream your multimedia from anywhere in the house or directly from the internet using practically any protocol available. Use your media as-is: XBMC Media Center can play CDs and DVDs directly from the disk or image file, almost all popular archive formats from your hard drive, and even files inside ZIP and RAR archives. It will even scan all of your media and automatically create a personalized library complete with box covers, descriptions, and fanart. There are playlist and slideshow functions, a weather forecast feature and many audio visualizations. Once installed, your computer will become a fully functional multimedia jukebox. Qweas is providing links to XBMC Media Center 10.1 as a courtesy, and makes no representations regarding XBMC Media Center or any other applications or any information related thereto. Any questions, complaints or claims regarding this application XBMC Media Center 10.1 must be directed to the appropriate software vendor. You may click the publisher link of XBMC Media Center on the top of this page to get more details about the vendor.